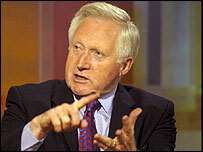 BBC NEWS | UK | UK Politics | How does web-TV politics shape-up? How does web-TV politics shape-up? Internet TV channel 18 Doughty Street claims to be challenging the political broadcasting establishment - but how does it measure up as an evening's viewing? That is what I set out to discover on Thursday, an evening when the newcomer goes head-to-head with BBC One's flagship political discussion programmes Question Time and This Week. The new channel - launched last month by a group of Conservative bloggers - does not have anything like the same budget as the BBC and other broadcasting heavyweights. There are no glossily-produced packages, big name presenters or studio audiences. It is mostly just people in a studio talking about politics. But unlike mainstream TV - which is bound by strict rules on balance and impartiality - the presenters and guests on 18 Doughty Street are free to be as opinionated and biased as they like. Would that make for a more lively and engaging night's TV, as the maker's claim? I was about to find out. At 7.30pm I dutifully switch over from Channel 4 News on the telly to the start of Brought to Book, with Andrew Burkinshaw, on the laptop. This turns out to be the gentlest possible of introductions into the world of 18 Doughty Street. US author Ian Bremmer speaks for half an hour about his new book, the J Curve, with the occasional mild prompt from Burkinshaw. It is, if nothing else, an antidote to the Paxman/Humphries school of interviewing. 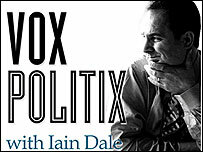 Up next is Conservative blogger Iain Dale with Vox Politix. This is a straightforward talk show, which tonight - in a break from the norm - is mostly about foreign affairs. Topics range from Trident to a trade deal between the US and Colombia. The two guests, Tom Clougherty and Alex Singleton, are both from the same organisation, The Globalisation Institute - something which, for better or worse, you would rarely, if ever, see on mainstream television. The next half hour is taken up with business strand Your Money. On mainstream TV this would be a cue for something about personal finance or consumer issues. Here it is all about red tape and how the government is wasting, well, your money. Tonight's topic is the police. The presenter is James Frayne from the Taxpayers' Alliance, a grassroots pressure group set up with backing from heavyweight Tory donors, among others, to make the case for lower taxes. Frayne's guests include Burning Your Money blogger Mike Denham, freedom of information campaigner Heather Brooke and Blair Gibb, from the Taxpayers' Alliance. Everyone seems to be in broad agreement on what has gone wrong with law enforcement in the UK - too much red tape and political correctness - and there is some discussion about middle class disenchantment with the police and the merits of hiring private security guards. At 9pm Iain Dale reappears for Up Front, featuring an all-woman panel. This must be the "Ladies Night" he has been promising us all evening. Like Your Money, it feels a little cliquey, as Dale, a Conservative election candidate, quizzes fellow Tory A-listers Andrea Leadsom and Margaret Doyle about how to get selected as a Tory candidate. Anne Jenkins, wife of Tory MP Bernard, provides a mini-exclusive when she reveals her campaign group women2win is hoping to set up a fund to help Tory women gain selection. At 10pm, just as the main news bulletin is starting on BBC One, Iain Dale is joined by co-host, Andre Walker, a former Tory press officer, who injects a bit of Yorkshire vim into the proceedings. Everyone is still speaking from broadly the same perspective but new guests, including ConservativeHome supremo Tim Montgomerie and Simon Marcus, who set up a gym in North London to keep youngsters off the street, arrive and the debate starts to range more widely. There is much discussion about Iraq and that day's bombings in Baghdad. The talk also turns to personal responsibility and debt - and the Tories' controversial new "tossers" campaign. This is lively enough to distract me from the opening minutes of Question Time, from Hartlepool, over on BBC One. I drift back to Dimbleby and co as they are discussing religious symbols but the show does not really burst into life until someone asks a question about Iraq and there is a fascinating stand-off between Polly Toynbee and Esther Rantzen. Toynbee, who is against the war, has been in the news herself after Tory MP and policy adviser Greg Clark urged the party to listen to her views on poverty rather than those of Winston Churchill. This has, needless to say, been a hot topic on Doughty Street all night. The consensus, expressed most succinctly by Tim Montgomerie, is that - whatever the merits of Toynbee's arguments - Conservatives should not be giving her the "oxygen of publicity". When the subject comes up on Question Time, Toynbee declines a polite offer from Tory deputy chairman Sayeeda Warsi to join her party. The debate then takes a surreal turn, with Esther Rantzen saying the person David Cameron should really idolise is Lady Godiva. Then Denis Macshane says he once saw David Cameron naked in a Westminster gym. Over on Doughty Street, they are debating what Andre Walker calls the "myth" of middle class drug use. There is also a bit of banter about the 2012 Olympics. Iain Dale says he is tired of the relentless negativity of Doughty Street guests on this subject. On Question Time, things draw to a close with the question: "Is Rupert Murdoch destroying democracy?" Interestingly, the only panellist to really stand up for the media giant is Labour's Denis Macshane. Over on Doughty Street they have nothing but praise for the Murdoch press - it is the only organisation to have delivered their newspapers on time. Undeterred, the Doughty Street boys - and it is by now an all-male panel - leaf through the Sun and Times for their regular end-of-the-day paper review, tackling the subject of illegal immigration and then "killjoy bosses". Meanwhile, the Murdoch empire comes in for another bashing as This Week gets underway on BBC One, with Murdoch's business rival Sir Richard Branson giving his "take of the week". Ever mindful of the need for balance, This Week presenter, and former Murdoch employee, Andrew Neil offers his old boss the right of reply. This Week regulars Dianne Abbott and Michael Portillo are just getting into their stride, as 18 Doughty Street is signing off for another night - and I decide to do the same. 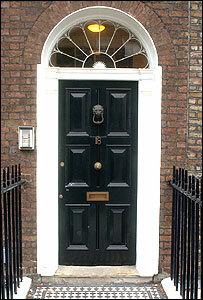 10 Doughty Street broadcasts between 2000GMT and 2400GMT Monday to Thursday at www.18doughtystreet.com. 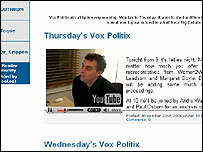 Most programmes can be viewed again online and clips are posted on YouTube. Question Time can be viewed again at http://news.bbc.co.uk/1/hi/programmes/question_time/default.stm and This Week is at http://news.bbc.co.uk/1/hi/programmes/this_week/default.stm.